Who hasn't wished, at one time or another, to be someone or something different? Thinner, taller, more melodic, younger, older ... the list goes on. 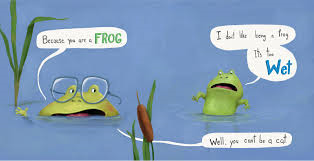 Frog is no different from the rest of us. What he doesn't like about being a frog is that frogs are too slimy, too wet and eat entirely too many bugs. Other animals have a certain allure. While reading a book about cats, he tells his father that he wants to be one. 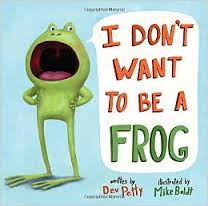 His father is patient in his explanation that his son is, in fact, a frog and cannot be a cat. Not to be undone, the little one changes his mind to an animal that has similarities - he wants to be a rabbit. He can hop! His father points to his ears as an explanation for another unwise choice. Poor son! Poor, beleaguered dad! When a pig passes by, a third wish pops into his head. Again, his father explains why being a pig is not possible. And certainly not an owl. There are many reasons why that cannot happen. As they share their tasty bug sandwich, Papa nixes any change at all. To the rescue comes a huge, hairy wolf with a cautionary comment about his own personal diet. He loves to eat cats, and rabbits, and pigs, and even owls. In fact, he's pretty hungry right now. Luckily there is one thing he never eats! Mike Boldt does a terrific job of creating a dynamic duo whose expressions and personalities are the ideal accompaniment to this funny story. The youngster, mouth wide open at all times, is the epitome of the ever-questioning child and the father, glasses intact and advice at the ready, is endlessly patient. They are pitch perfect. The colored speech bubbles will help early readers share read this funny tale, and then share it all over again using the other voices. "I'll save you one for later." 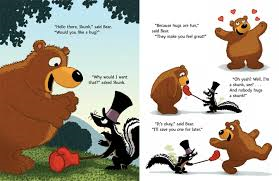 It's got to be tough being a skunk when there's a bear around who's constantly handing out 'bear hugs'. Skunk is pretty good at pretending that it doesn't matter much at all. In fact, he sets himself the task of making Bear smell just like him, or worse. He uses his case full of 'Super Stinky Tricks' to bring that un'bear'able hugger to his knees ... stinking to high heaven, and then being rejected by every single animal that ever begged, or cajoled, or just stood close enough to Bear to garner the warmth of one of his many warm embraces. Every time Bear offers to hug Skunk he is rejected. Each time he is rejected he lets Skunk know that he will save him one 'for later'. The plotted stinky tricks backfire when Skunk becomes the object of his own chicanery. It is very funny for young readers (and listeners) to predict what is bound to happen and then, to giggle gleefully when it does. A dead fish catapulted directly at him misses when the engaging Bear bends to stroke a nearby earthworm, and the fish springs back from the tree it hits ... a direct SMACK to Skunk's face! There are two others, equally funny, that result in Skunk finally admitting defeat. He is dejected by it all. 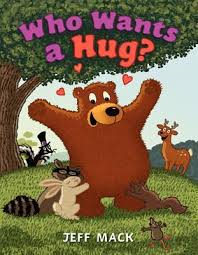 Of course, Bear is right there to offer up consolation in the form of a hug. Skunk can no longer resist! The results for both animals play out in the final five pages, much to the delight of everyone who will share this story. The characters are lovable, each in his own way. Jeff Mack fills the pages with expressive faces, funny situations and offers up perfect dialogue for his audience. Inadvertently, we might all realize that those old wooden clothes pegs still have some life in them! Charlie is enjoying the view from the balcony when he notices a hubbub in the street below. Calling to his dad to tell him that there is some excitement in the form of a parade, Charlie is surprised when the two quickly follow along. Arriving at a nearby park, he is further surprised to see that the parade ends at a huge pile of black dirt. It's the mayor's annual Dirt Day Giveaway. There is 'free dirt for everyone.' But it's not just any dirt. "It's the richest, dirtiest dirt you'll ever see. It's fresh compost. Your gardens will love it." 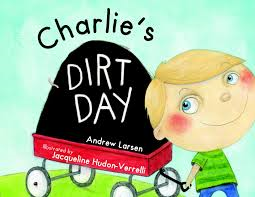 Charlie has questions for the man who is encouraging people to take some dirt home. From him, he learns how compost is made, and how people use it. A neighbor explains how he will use the compost ... and that the end result will be a delicious (and famous) spaghetti sauce. Home Charlie goes with a little clay pot full of soil and one small seed. What will it grow? Back matter includes further information on dirt, composting, gardens in the sky (rooftops and balconies), worms, and how to make your own 'compost in a cup'. Let's keep our fingers crossed for warmer weather so we can all 'get growing'! If you are a fan of the first four books in the Life in the Wild Series (Big Bear Hug, The Busy Beaver, Making the Moose Out of Life and Up The Creek), you will be delighted to join these three fast friends on yet another adventure. This time, they decide that climbing a nearby mountain might just be the perfect outing. Off they go! They have a trusty map, a walking stick, a compass and a red bird. They love adventure, as you know; they are very competitive, as you also know. So, you have probably figured out that things will not go according to plan. You will also know that there is sure to be a laugh or two. The first part of their trip involves a valley, a grassy field, a stream and a deep canyon (DON'T LOOK DOWN). As they reach the foot of the mountain they are about to climb, they sit for a snack and a chat. How to make the trek more interesting is the topic. Beaver knows ... they will race to the top. Oh, boy! Moose is in the lead when he jumps out of the way of a boulder and falls over the side of the mountain. The bear is willing to try saving him. Inevitably, it is beaver to the rescue. The rest of the trip plays out as one of the recurring joys for this team of forever friends. 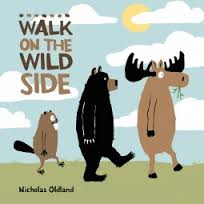 Nicholas Oldland's digitally created illustrations will be familiar and charming to fans. 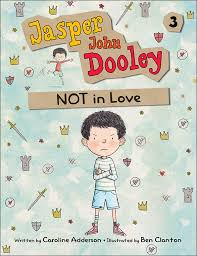 The characters are droll, and endearing. The setting is cleverly designed. If you want a book about friendship and being kind, this would make a perfect story to read aloud! "On crutches I didn't need a taxi, so we walked right down the main street. I walked down the street, bad foot and all, and nobody stopped me. We went into the shops and bought meat and veg and groceries. I went into the shops and nobody turned me out." In another war story for today, we meet Ada who has never spent a minute outside the family's third-story apartment. Her mother will not allow it; she is ashamed of her daughter and her twisted foot. Ada sits at the window and waves to others, and longs to change the circumstance that keeps her trapped inside and crawling wherever she wants to go in the drab one-room living space. "What about me?" My voice came out smaller than I liked. "Am I going? What about me?" Mam still didn't look at me. "Course not. They're sending kids to live with nice people. Who'd want you? Nobody, that's who. Nice people don't want to book at that foot." "I could stay with nasty people," I said. "Wouldn't be any different than living here." We learn in quick time that the resilience Ada shows in learning to walk is only the beginning of a fight for a better life for her and for her little brother, Jamie. They escape, without their mother's permission, to the safety of the train taking them away from London. A woman with no children, and no wish to have any or knowledge about caring for them, reluctantly takes them in. Crutches help Ada navigate the farm and its surroundings. Finding a horse that is rarely ridden, and learning to ride it is just one more obstacle she faces with grit and determination. It takes time; reluctantly, Ada accepts that Susan cares for them and is giving them a good life. There is so much for the two to discover in the safety of this new home. Ada's first person narrative lends humanity to the people she meets, tenacity to the many troubles that must be faced, honor to the power of community and love. Her resolve is heightened knowing that there are those who will love her unconditionally, and that makes all the difference. This story is written beautifully. Ada is a fine and memorable narrator, the setting is realistic and dramatic, the characters are worthy of our admiration. You will not soon forget them! than a hole in his head." Not all of the scars of war are visible, as many of our returning military troops and their families know. In Michael's grandfather's case, the physical scars are all too visible. They do not in any way account for the internal scars that are also a part of each waking day for him. Michael vividly remembers the nightmares he had as a child. One of the enduring ones seemed to coincide with his grandfather's infrequent visits. In the dream, he sees a great ship going down in flames, men on fire jumping into the sea, and his grandfather swimming in search of a lifeboat and a modicum of safety. No one will help the man who comes to the side of the boat and raises a pleading hand which has no fingers. Before each visit, his parents warn Michael never to stare at the injuries his grandfather has incurred as a sailor on a merchant marine vessel during WWII. A torpedo sank the ship, killing many and leaving his grandfather with ghastly scars on his face and hands. When the time comes for Michael to spend summers with him, fishing and living at his island home, Michael learns a lot. "He was silent, I discovered, because he liked to keep to himself. I'm a bit the same, so I didn't mind. He wasn't at all unkind or morose, just quiet. He'd read a lot in the evenings, for hours, anything about boats - Arthur Ransome, C.S. Forester, and Patrick O'Brian. He didn't have a television, so I'd read them too. 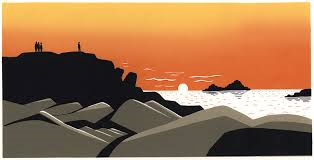 I think I must have read every book Arthur Ransome wrote during my summers on Scilly." His death, and a note left to his grandson asking that the family gather to scatter his ashes in the sea he so loved, is the catalyst for some healing. 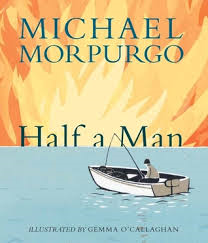 This is an emotional tale told with the grace we have come to admire in Michael Morpurgo's powerful writing. "They sat right up front. had butterflies in a jar. smile and a "good afternoon." She made sure CJ did the same. Do you find yourself often wishing for something more? One of the real pleasures of growing older for me is that I know I have more than enough ... and really don't have much on my wish list. That is not to say that others should feel the same way. I want to be 'just like Nana' in this wonderfully brilliant new story from two superb artists. CJ and his Nana have been to church and are now waiting at the bus stop. "Watched rain patter against the windshield of a nearby car. and drove off with his dad. "Nana, how come we don't got a car?" It is the first of a number of querulous questions from a grandson to his patient grandmother. As the bus pulls up and they climb aboard, they happily greet the bus driver, and the people who are sharing their ride. CJ is filled with questions and comments about how lucky his friends are not to have to ride this bus, and about the people on board. He sure feels sorry for himself. As new passengers climb on, Nana is welcoming. She encourages her grandson to see the beauty in the diversity of the world around them. Rather than coveting the music player and earbuds that two other young passengers have, why not listen to the guitar-playing singer across the aisle from him. Will CJ feel the magic? "He saw sunset colors swirling over crashing waves. dancing free in the light of the moon. and the sound gave him the feeling of magic." At the 'last stop on Market Street' the two disembark and stroll toward the soup kitchen which is their weekly destination. Along the way, CJ manages to see through his Nana's eyes the possibilities in the world and the people that surround them. There are days when it does seem difficult to find beauty in the world ... even for adults. Would that we all had CJ's Nana to stand by and remind us how truly lucky we are, and how grateful we must be. 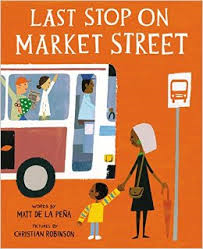 How thrilled was I that, on the day I received a copy of Last Stop on Market Street, I heard a short interview with Matt De La Pena and Christian Robinson on NPR Morning Edition? In the interview they were asked if the experience they were sharing came from their own lives. Both said that it did. Their grandmothers had been instrumental in their upbringing, and both had encouraged the boys to be thankful for the each of the blessings in their lives. This is the first of two books about buses today. Each helps us to see how truly diverse our world can be! I love the way this book is designed. Opening to the first page gives the reader the feeling of riding a bus, with its long horizontal lines and the opportunity to include so much in the artwork on the double page spreads. We watch as the bus pulls up to where a small girl and her mother are holding hands at the #18 stop. Clara gets on board, waves to her mother from the window, and promises to be good. Her companions on this first solo bus ride are numerous and varied; with each stop those passengers change. In a strong first person narrative, Clara lets us know that she is well prepared for the ride - she has a snack, and a sweater. As they roll along, the action is non-stop and certainly in need of our attention. Each double page spread is filled with details about her fellow passengers. As we go, she gives us a play by play of the outside world as well. The setting changes are evident through the windows of the bus, and include a short, somewhat scary pass through a dark tunnel. We watch as passengers get on and off the bus, each illustration adding telling vignettes of their lives and family. A goat offers a small flower from a large bouquet, the sloth sleeps, the mole mother is distracted by her exuberant family of three little ones (who seem to have enough energy for several more), the sloth sleeps, the turtle tucks in every time the action becomes too much for his quiet personality, a woman with a newspaper full of telling headlines remains faceless, the sloth sleeps. Each character has its own distinct personality. There is no being alone on this bus ... and that is the delight of it! Adventurous and full of charm, with illustrations that will have little ones wanting to pore over it again and again, we are reminded of Little Red Riding Hood but never feel threatened by the animals who share Clara's space as she makes her first trip alone to Grandma's house. Imagine the stories she will have to tell her grandmother of the community of fellow travellers she met along the way! "Jasper was surprised that Ori was late. Ori lived across the alley and one house down from Jasper. Jasper lived closest to the school, and Ori the second closest. Ori never got the lates the way Jasper did. Jasper got the lates about twice a week, even though he lived just one block away. But not today. 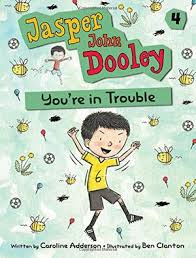 Today Jasper was the Star ..."
I started reading this bright and funny series on the recommendation of my friend Jane who loves them, as do the kids in the school where she is an enthusiastic and informed teacher-librarian. There are four so far, and I will hold out hope that there will be at least four more ... or many more than that! I love it when a series works so well! 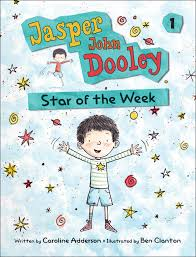 Jasper is a force to be reckoned with ... in the first, it's finally his turn to be Star of the Week! It has meant long endless days of barely contained enthusiasm for the world that will be his for a whole week. His relish for the job at hand may not meet up to those lofty expectations. Jasper rarely lets anything get him down. His best friend Ori has a new sister, and she is a real distraction from Jasper's celebration for the week at school. In fact, because of Plum (so named for the color she turns as she wails night and day), Jasper finds himself longing for a sibling. His parents are not so gung-ho about his request. So, he builds his own. The dialogue is wonderful, the humor made me laugh out loud. The black-and-white illustrations are a perfect complement to the text that is sure to encourage those young readers wanting to branch out into a chapter book format. Jasper is so charming and real that they will be glad to share his everyday ups and downs. 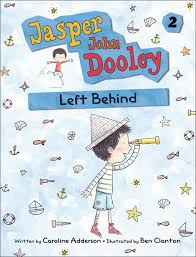 Then, they will reach for the next book in the series ... Jasper John Dooley: Left Behind. a story stapled to his stomach, trying to build an exact replica of Nan's cruise ship from unused lumber, dealing with a bossy friend, taking the class hamster home for the weekend and losing it. His life is impossible without Nan in it. Has a week ever lasted so long? You will be smiling as you pick up Book 3: Not In Love! Jasper and Ori have often played 'babies' for Isabel and Zoe; they only do it when the rewards are worthwhile treats at the end of the embarrassing play. The girls are persistent, especially Isabel who has her eye set on marrying Jasper. To that end, she has their mothers arrange a playdate. Jasper is not impressed, but reluctantly attends. Once there, Jasper is surprised that Isabel doesn't want to just sit around brushing his hair. She has a TRAMPOLINE! Jasper is bewitched by it, and that transfers into his thinking he might be as 'in love' with Isabel as she is with him. He realizes he is mistaken and asks advice of his Nan. In a series of plans gone awry in response to Isabel's attention, Jasper is finally able to take control and looks to Ori for all the friendship he really needs! Now, we are on to Jasper's newest escapade: You're In Trouble. Bad is the name of the game for Jasper and trouble is his middle name in the latest addition to the series. Following a soccer practice, Jasper he uses the change his father has given him to buy a drink from the nearby vending machine. With the machine beeping and flashing instructions, he mistakenly selects a BAD drink...one of those power drinks filled with sugar and a whole lot of caffeine. He knows he has done wrong, and hides the fact from his father. Taking little sips before they head home, then saving the rest of it at the back of the fridge in hopes that it won't be discovered, means that he is able to drink from the can for few days in a row! Each time, he is like the Energizer bunny gone wrong and is quite delighted by the BAD choices he makes about what underwear to wear, riding his bike too fast, tickling soccer players during game play. It is pretty embarrassing. It is also hilariously funny for those reading his story. Ori tries to intervene with good food meant to lessen the effects of all that sugar. Jasper can't eat it ... he hates celery! There are consequences; luckily they are not long lasting. Engaging characters, pitch-perfect dialogue, humorous everyday experiences ... this series has everything to attract young readers. 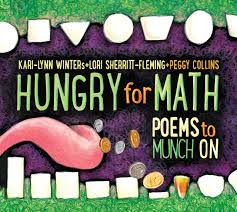 Perfect for those wanting to read more complex text on their own, and absolutely wonderful to read aloud to your family or your students. Bring on #5, please! "Good grief! Would you look at her!" said the rat when she spotted the rabbit. "Um ... yes. I was just wondering what she was doing there," replied the dog, a bit startled. It had been so quiet until the rat came along. "She is totally flat," said the rat." Dealing quietly, yet profoundly, with death is the subject matter for this beautifully designed book. A dog walks nonchalantly along a city street, looking skyward with admiration. As he rounds a corner, he is surprised to see a rabbit splayed out on the road. 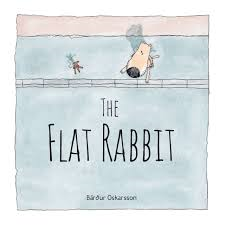 A rat comes along and makes a remark about the flatness of the rabbit. a couple of times, so we've definitely met." The two ponder the rabbit's plight and cannot think what to do with her. Off they go to the park to spend time in quiet contemplation. When dog finally has an idea, he shares it with the rat. They go back, and protectively peel the rabbit from the roadway, then work through the night to put their plan into action. In the morning sun, we see that the rabbit has been meticulously taped to a brand new kite. Back to the park they go, with the kite in hand and their plan in place. As the work to get the kite airborne, we watch as well. 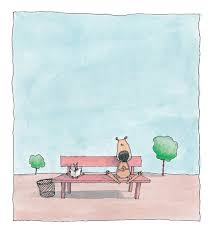 The watercolor illustrations are spare, but tell their story with the same simplicity and grace as do the words. The changing perspectives help us to see how tiny the animal protagonists are in terms of their world. The kite's-eye view presented to end the book leaves readers with a feeling of comfort and a need to talk. "It was hard to tell what this boy would look like on a day that wasn't so hot, but with his bright red hair and freckles, it made me think someone had lit a match, then as a joke dressed it in knickers, a suit jacket, and a necktie. He gave me a little smile. For a second I wondered if he said this because he was being racialist." We are back in Buxton, Ontario. It is a town, as you will know if you read Elijah of Buxton (Scholastic, 2007), that was settled by those who opposed slavery and by runaway slaves. It is now forty years after the memorable events of that first tale. The two main characters are Benji Alston and Red Stockard. Benji is a black boy, and lives in Buxton. Red is of Irish descent, and lives in Chatham. Their towns are separated by the Piney Woods. Both have heard scary stories of a wild man who lives in those woods. Their stories are told in short alternating chapters, with humor and with a sense of adventure that will keep readers moving to the place where those stories make a connection. Full of suspense and not a little worry that the boys might get themselves in real trouble, I powered through the reading in one sitting. It is intense and engaging. Yet, at every turn, I felt hopeful that life would be enriched by their meeting. Together, they work to solve a mystery. As we read their separate stories we have a real sense of what life in Canada was like in the early twentieth century. We meet secondary characters, whose presence will cause readers to wonder about their families and their troubled lives. Curly and Petey are not soon forgotten. Nor is Grandmother O'Toole! The 'madman' is Cooter, a Civil War survivor, whose story is heartbreaking and a testament to the horrors of the trauma unleashed during combat. His need to live in the solace of the woods has fueled the stories of a wild thing lurking there to terrorize and hurt anyone who might come near. As this story unfolds we learn more about both Red and Benji. Red is missing his dead mother, his father does his best to show warmth and affection in light of the fact that Red's angry, bigoted, tragic grandmother is living with them to help out. Benji lives with strong support and a loving family. Both have heard the terrifying stories of a mysterious 'monster' living close by. "Cooter always did look younger than he was, so 'stead of enlisting him as a soldier, they took him on as a drummer boy. He joined up with the Sixth Regiment United States Colored ... He never would talk about it, but he had some times in that war that no one should ever have to go through. No one. Especially not one as kind as Cooter." I laughed and I cried with these remarkable characters. 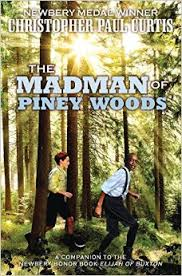 Once again, as I have been with each and every book written by Christopher Paul Curtis, I am in awe of his storytelling. He writes with power, and an uncanny ability to keep us always moving forward with hope despite the feeling of being reticent to find out what might happen next. Brilliantly plotted with exceptional characters and a fine story to tell, it a book that should be shared and discussed in middle years classrooms. Before Crankenstein spoils your day, or makes you laugh just a little too hard, let me wish you a very happy day full of family love and laughter. HAPPY VALENTINE'S DAY everyone!!! 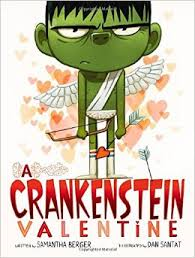 You can't get past the front endpapers filled with candy hearts without knowing just exactly how Crankenstein feels about the day: SOUR PUSS, WHATEVER, NOT GOOD, SNARL, P.U., BUH-BYE! Little ones will want you to read them again and again. 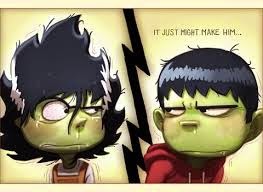 Crankenstein's attitude about life remains unchanged since we were first introduced to this champion of grump (Crankenstein, Little, Brown, 2013). Imagine how the sweetness and overpowering love of a day such as today only ramps it up! YECHHHH! is evidently his very favorite word as he awakens to a world awash in red, and an expectation for taking a teacher gift, accepting a smooch on the bus, and eating a lunch that reeks of hearts and love! No matter where he turns he is offended. Well, there might be one exception. Lucky Crankenstein! LOVE LIFE, HEY BUDDY, SMILE, AWESOME, I HOPE, HIGH FIVE! 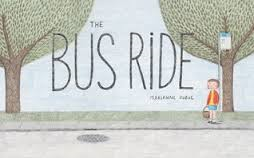 This is the second collaboration between Samantha Berger and Caldecott winner Dan Santat. Ms. Berger gives readers license to use drama and a raised voice to bring Crankenstein to life on this most repugnant day of his year. Dan Santat weaves humorous details onto every page. Crankenstein's expressions are endlessly fascinating. His monstrous demeanor, and his companion character will have kids howling. Irreverent, yes! Solidly entertaining, oh, my yes!!! "It doesn't matter whether you write on a fancy laptop or an old typewriter or, for that matter, with a pen on a paper napkin. All of that is beside the point. The point is that stories want to be told. Stories have a power of their own, and they choose their writers carefully. But you can't write a story until you've felt it. Breathed it in. Walked with your characters. Talked with them." Oh, I know some readers who are going to LOVE this new fantasy! Tuesday McGillycuddy is beside herself with excitement now that school is done for the summer. Eight weeks to spend with her parents and her dog, Baxterr. The only hitch may be that her mother, the famous author Serendipity Smith, has not yet put the finishing touches and the End to her latest Vivienne Small adventure. The family will have to wait to celebrate until it is completed. "Sitting at the kitchen table, Tuesday wondered what her mother and father had planned for this holiday. A summer sojourn, her dad had said. Perhaps that meant the beach, but it might equally mean walking in the mountains or sailing on a yacht, which Tuesday had never tried, although she dearly wanted to. Or it might mean a tropical island with palm trees and a long white sandy beach and a little house with a thatched roof." Later that day when her mother doesn't come down from her top story writing room, Tuesday is concerned. Her father suggests that she might tiptoe up and see if she can hear anything from beyond the door. Nothing. Her father decides that he too will investigate. When they get no response, he quietly opens the door ... the window is open, Serendipity Smith is gone! Dad Denis shows no anxiety, assuring his daughter that her mother is bound to be home before breakfast. But, Tuesday gets no rest. She returns to the studio and finds a silver box which contains a delicate thread that spells The End. Those two telling words will not stick to her mother's manuscript. Tuesday decides to begin her own story - that is when the real adventure begins, as well. The words lift off the page and carry Tuesday and Baxterr out the open window. Off they go to the land where all stories are written. "... he continued, "First published at twelve. Million books sold by the time I was thirteen. Two films in the making. Jack Bonner - my hero - bestselling action figure last Christmas, in case you've been living on the moon." As if meeting a self-assured teenage author isn't enough, Blake introduces Tuesday to the Librarian. She is a much respected and helpful character for Tuesday, while also being demanding and quire inflexible with her expectations of writers. In this author's world Tuesday is lucky enough to meet her mother's character Vivienne Small, and asks her to help find Serendipity. 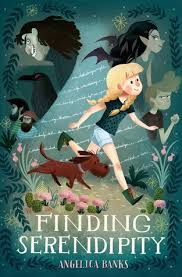 Their wild adventure conjures up characters from her mother's fictional world, and a whole lot of trouble! Inventive, funny, fresh, and fast paced, this book is an homage to the power of the imagination and the written word. It will be especially loved by those who love adventure, a touch of magic and a feisty heroine who plods on despite obstacles until all is right in her world again. You know the ones! "I wanted to bring Black History Month alive. I wanted to go beyond the familiar names and faces I saw every year without new additions. I wanted to show the variety of accomplishments black people have achieved, not just in the long ago past, but in recent times and present day as well. Ultimately, I wanted to provide a wealth of information for teachers and students alike all in one book." 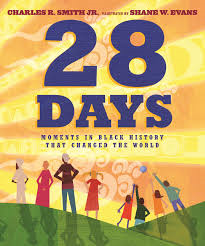 When his editor, Neal Porter, asked him to consider a book that was focused on the 28 days in the month of February, Mr. Smith set about finding stories. He made the decision to start in 1770 with Crispus Attucks , and then move forward to the present, and President Barack Obama. the first blow for liberty. for the flag we hold high." 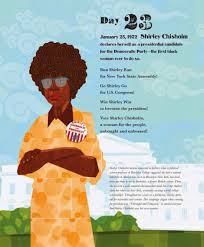 Following the poem, there is a short, detailed paragraph concerning Crispus' life and his place in black history. With each turn of the page, the author and illustrator provide text and context for those chosen to tell the rest of the stories. Some of the subjects chosen are lesser known than the more famous men and women many of us have come to know. I was inspired to learn their roles in the many events showcased here and to learn of their sacrifices, despite being often faced with hatred and cruelty. There was so much I did not know! I did know about Bessie Coleman and Madam C.J. 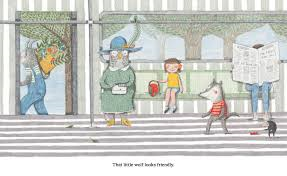 Walker; I had read exceptional picture book biographies about them (Fly High, Borden, Simon & Schuster, 2001, and Borrowed Names, Atkins, Henry Holt, Macmillan, 2010). The research is clearly exceptional. What a terrific way to get children and adults talking about bravery, strength, endurance, loyalty, self-confidence, and personal dreams and goals. Shane Evans creates brilliant artwork to accompany each poem, using collage and oils. The colors are bold and the images powerful, totally in keeping with the power of the poems shared. The final poem, Day 29, is for today and every day! 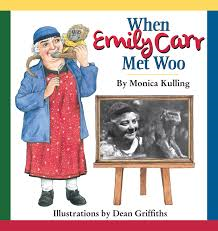 Emily Carr is not an easy artist to introduce to a young audience, unless you appeal to their love for animals and share her story with a focus on those animal companions she so loved. Emily was eccentric, of that there is no doubt. town pushing a baby stroller filled with puppies." It wasn't only her penchant for the menagerie of pets who shared her home; many people found it difficult to understand the art she created. A visit to a local pet shop brought her face to face with a lonely monkey. Emily could not leave him there. So, she traded one of her puppies. She and Woo became great friends. Woo loved to make trouble: for the other animals, and for Emily's sisters who often visited. But, Emily loved her. "Woo lay quietly on the floor. Her eyes were closed and she whimpered. Yellow paint covered her mouth and paws. "Oh, Woo, what have you done?" sobbed Emily. A long night followed with Emily holding Woo and praying for her recovery. As luck would have it, Woo made it through that night. Together, they left on their trip to the forest where more of Emily's stunning and iconic art was created. An author's note follows to allow readers a chance to know more about Ms.Carr. It includes an archival photo, as does the front cover of the book. Three of her paintings are represented on the back cover. Dean Griffiths uses mixed media to give Emily's love of animals prominence. Monica Kulling tells her story in a way that ensures engagement for her young audience. "I kept yelling, to keep noise coming out. It was having an effect: Drummer reared, repulsed, like I was spraying him with water. He started backing from the clearing, still barking, but more quietly now. Then, with a crashing of foliage, he disappeared into a thicket and was gone. Mango squeaked in panic and fear. Again I lay low, palms upturned ... "
Luc is s street boy when we meet him, searching for family and a home. He is an orphan, indentured to a local debt collector to pay off his mother's medical bills that grew exponentially more expensive as she lost her battle with AIDS. Now, he works for Monsieur Tatagani to keep from starving to death. 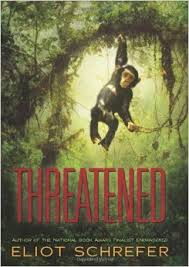 A fortuitous meeting with the Prof, a researcher for the National Geographic Society, soon has Luc accompanying him into the jungles of Gabon in search of a large group of chimpanzees for observation and study. The Prof wants the world to know more about their threatened existence. The research team is small - the Prof, Luc and the Prof's vervet monkey Omar. Soon after they set up camp they begin to meet with the family of chimps that live in the neighborhood. Their first encounters are frightening; together they must set the boundaries for the relationship that they establish. As they come to understand one another, Luc notes that the chimps are very humane. They protect each other with aggressive posturing, and also prove to be kind with very unique and distinct personalities. Luc spends many hours observing, developing lasting relationships with the mock men, and helping to protect them from hunters and other dangers. This book is so beautifully researched and wonderfully written that the reader feels drawn directly to the Inside (the jungle) where humans are not supposed to be. The deep wild of the jungle that eventually embraces the Prof and Luc is a wondrous place and the community they forge with the chimpanzees is the first to have real meaning for Luc. I was drawn from page to page with alarming speed; at times, I had to put the book down to take a breath and slow my heart rate. The characters, both human and chimpanzee, are intricately drawn so that we feel an empathy toward each and we root for them to forge lasting relationships and a peaceful community. Through his characterization of the chimps that become an important part of Luc's life, we see how closely they do resemble humans, in kindness and in hostile, destructive behavior. Character driven and fast paced, this is a survival story that is certain to win new fans for Mr. Schrefer and might lead those who haven't read his other works to find them at the library and get busy! It is a most worthwhile pursuit. "I notice things other people miss. I think it's because I'm an artist, so I have an eye for detail. You know the smokestacks at the Plastics Works? You never see any smoke coming out of them. My parents say it's because the factory is a green industry that doesn't pollute. Steve (aka Dad) says they switched over in 1978. We're ahead of our time in Serenity." Serenity, a small New Mexico town, is isolated from the world beyond its town limits. It seems idyllic ... there is no crime, every adult in town has employment, every family has a home, food on the table and a good life. While the adolescents we come to know are not always content with life as they are living it, that is not a lot different than it is in the rest of the world. The first time that Eli allows himself any concern about Serenity happens when he tries to ride his bike outside the town limits and is incapacitated by pain and nausea. His friend has convinced him that they should explore an old ranch a few miles away, just as Randy and his father had previously done. "Only pure stubbornness keeps my legs pumping. I'm in agony, blinded by the kind of headache that lodges behind the eyes like a glowing coal, pulsating and doubling in intensity. The pain is unimaginable. It's not just a terrible thing; it's the only thing.."
Everything changes when Eli's best friend is suddenly shipped off to stay with his grandparents in Colorado, without much of a chance to say goodbye. It isn't until Eli finds a note that Randy left for him that he begins to question what is really happening in their small town. They have always been led to believe that the Plastics Factory is the main industry and employs almost everyone in town. They have always been led to believe that what they are learning in school is what every other student in America is learning. He and his friends know nothing of war, or famine, or even negative thoughts. The Surety, called the Purple People Eaters by the young people, is a private security group that protects the town and its industry. So, the Eli and is friends have been told. We learn, along with our narrators, that they are so much more than that. When Eli finds Randy's note, it sets him on a path of discovery that is upsetting to say the least. With Malik, Tori and Ethan, he finds out that Serenity is in fact a scientific experiment devised by the man who claims to be his father. Some of the children in town have been cloned from criminal masterminds and are being raised in the 'perfect' environment meant to test the nature-versus-nurture argument. They gather further information by breaking into the Plastics Works, and then set about finding a way out of town before Malik is 'disappeared'. In doing so, they realize there is a signal barrier set up just outside town limits that makes them violently ill and unable to go on. A new plan must be devised. Nothing is going to stop them now that they have decided to leave. 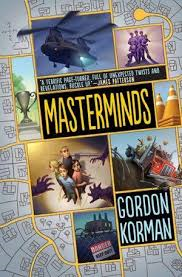 In this new series, Gordon Korman has created a cast of very strong characters, given them singular voices and written an action thriller that is so believable. It's dramatic and fast paced, but never seems evil. The ending is perfect, and will have fans begging for more about Eli and his fellow runaway clones. "Only female wasps and only some species of wasp can sting. Social wasps (which live in groups) may sting to defend themselves or their nests if they are in danger. Solitary wasps (which live alone) also use their sting to kill or stun their prey ... A wasp's sting injects venom (poison) into its prey." Just a reminder to check out http://www.dkfindout.com. You won't be sorry that you did! In this entertaining and informative book, the designers have included sections about space, the earth, living world, history, science and the human body. There is a listing at the beginning of each of those sections that shows the questions asked, and to be answered as you pore over its pages. Then, each double page spread repeats that question and strives to provide answers that make the learning engaging and worthwhile. 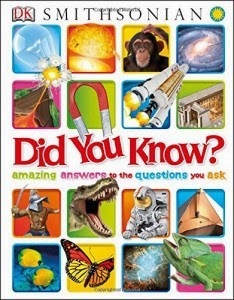 The 3-D illustrations and captions are well done, further information shared is placed on the pages in a box, and a quick quiz is included with three easy questions to be answered. This is a great early reference book, and will find fans who just want to pore over its many well designed pages. The focus is on subjects of great interest to children and is sure to hold their attention. The spread that concerns living in a castle shows a birds-eye view and cross-sections of the castle itself, and all that can be found inside. Arrows point out such things as living rooms, the moat, the drawbridge, the defence towers, and the main entrance. We are also told that it is a concentric castle from the 13th century. The information box is concerned with luxury living and the quick quiz reminds readers to think about what they have learned in their reading. And not to belabor a point, but don't forget to check at http://www.dkfindout.com for a tremendous resource for your home and your classroom. "Glamorous, colorful, and even musical, the birds are a dazzlingly successful group of animals. There are nearly 10,000 species, ranging from tiny hummingbirds to flightless giants like the ostrich. We now know that they are all feathered dinosaurs, related to the giant hunters of the past." Before I tell you about this fun and interactive book for kids who love knowing all that they can about animals, I want to tell you about something new and exciting from DK Publishers. If you have read my blog before today, you will know that I constantly sing the praises of the books being published by them. This week they launched a branch new website, and I would encourage you to check it out now. I spent an hour just moving from one page to another, watching the videos, checking the various links, and I think it will be a most effective tool to use with children who are always searching for new knowledge. "How many flowers can a bee visit in one minute? Note the page, the question number, flip to the back and you will find that the answer is 100! "Roughly how far can the low-frequency calls of great whales be tracked? Do you know? 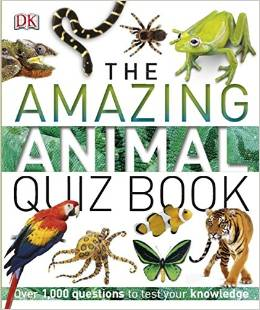 You will after you take the quizzes in this fascinating book! Oh, you want to know now??? The answer is 1,500km! "When I first heard Gayle, I couldn't tell is she was a bird or a girl. all I knew for sure was that the music she made wasn't like anything I'd heard before. It was magic. Even a kid like me could recognize that. I'd just come from clearing brush on the Emperor's property. He wasn't really an emperor, of course. His name was Mr. Azariah King..."
You must meet 'Little John'. He is not so little as he once was; that allows him to work with his father in his tree removal business. Together, they are working to clear brush for Mr. King. Mr. King is also known as The Emperor, named for the chain of dollar stores that he owns. His wealth allows him to control much of what happens in their small Texas town. "Ernest had been my best friend since we were three. But he hadn't come over in months. Not after I told him I wasn't interested in playing video games. It wasn't true. The truth was worse, though. Dad had pawned my game system four months before to cover the light bill. I figured it was better for Ernest to think I was acting mean than to know the truth about how broke we were." When he meets Gayle, a young and mistreated foster child with a powerfully beautiful singing voice, he is entranced. She is living in the branches of a sycamore tree. She tells him that she is waiting for her parents to come back for her. Her magical presence brings comfort and joy to John's life. Their friendship blossoms. It turns out that Mr. King is also captivated by the beauty of Gayle's voice, and Mr. King is accustomed to getting what he wants. What he wants is to record Gayle's voice ... or so he tells Little John. "It's just like Momma said. I got my nest, and my tree, already." She lifted her head. She wasn't crying. She was smiling, beaming. "It's all I needed. I can do it now. I can fix you, Tree." 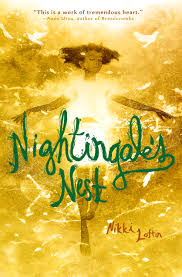 Nikki Loftin has written a remarkable story focused on love and loss, betrayal and healing. Loosely basing it on The Nightingale, she combines a bit of magic with harsh reality to ensure that Little John and Gayle will live long in our hearts. It is a story that begs to be read aloud. "Why were two doctors trying to tempt a mosquito to bite them? Although neither had much faith left in the experiment they were trying, they had come to Cuba a little over a month before in order to find the cause of yellow fever, one of the most feared and deadly diseases of the 19th century." "Across the world today, our defenders against epidemics are the scientists who strive to unravel the mysteries behind these deadly outbreaks. They search for clues that can tell us how a disease outbreak started, how it spreads and what puts people at risk of getting sick. We call these scientists who work on understanding and stopping disease outbreaks epidemiologists." It may not sound like the kind of medicine you would like to pursue, but reading Ms. Peters' excellent account of seven epidemics throughout history shows how this significant field of medicine has changed and improved lives. Those mysteries included are: the bubonic plague in London (1665); the cholera epidemic in London (1854); yellow fever in Cuba (1900); the typhoid cases in New York City in (1906); the influenza pandemic (1918-1919); Ebola virus in Zaire (1976); and AIDS in California (1980). Each section begins with an imagined version of what might have happened and how the outbreak affected families and communities. Other features include speculation about the cause, how scientific minds gathered information to predict outcomes, and information boxes that offer further information about the epidemic being described. Middle and high school students will find much to capture their attention as the writing is accessible and engaging, the mysteries concerning the illnesses are many, and the growth of research is well documented. 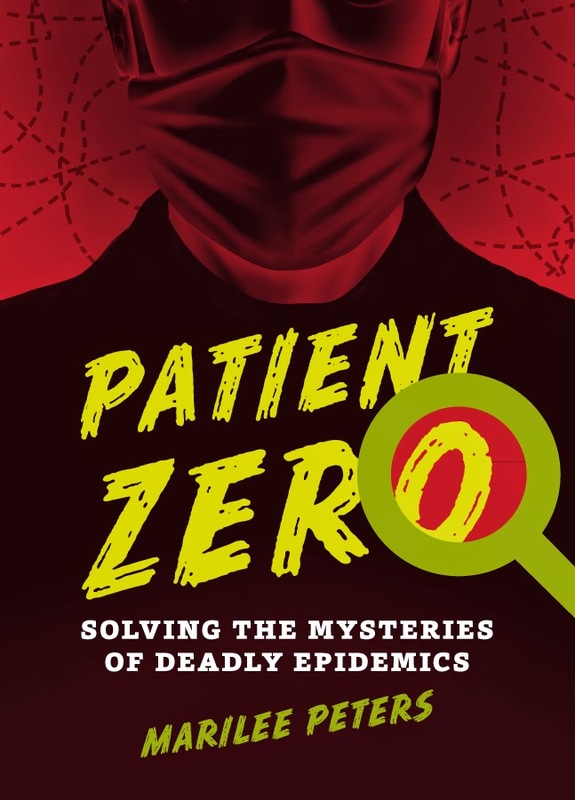 Always on the lookout for 'Patient Zero' - the first person to have contracted the disease - scientists worked tirelessly to improve their knowledge and were chastised for the work they were doing. They were a determined lot and have done much to help solve some of the issues that epidemics spawn. "To this day, no one knows how the six-month-old baby got cholera in the first place. But thanks to John Snow and Henry Whitehead, people came to understand how Vibrio cholerae from Frances' diapers infected an entire neighborhood. The epidemic was a terrible tragedy, but from it the world learned how future epidemics of cholera could be prevented." We are reminded throughout this well researched and very informative book that millions of people owe their lives to the pioneers who made a difference at the time they were dealing with the seven epidemics here mentioned. We are thankful to each one of them today, and to the many who continue their work to keep world citizens healthy and strong. "I kept it to myself. I hid it away and didn't talk about it. I tried to act like everything was the same as it was before my idea showed up. But there was something magical about my idea. I had to admit, I felt better and happier when it was around. It wanted food. It wanted to play. Actually, it wanted a lot of attention." Ideas are amazing things! They can evoke exhilaration, angst, and even dismissal. There are times when ideas can overpower. There are also times when accepting an idea for what it is, letting it grow and prosper is the very best solution. In this empowering story, a young boy has an idea. It looks like a golden egg, and it has legs. Days pass, the boy gains confidence in his idea, and the idea seems to prosper because of that. The message is clear to young readers. When you have an idea, give it a place in your heart and the time and space it needs to grow. It's not going to go away! "And many of them did. They said it was no good. They said it was too weird. They said it was a waste of time and that it would never become anything. And, at first, I believed them. I actually thought about giving up on my idea. I almost listened to them." He comes to realize that his world will now be much changed without the presence of the idea. It helps him to look at the world from a different perspective, and to enjoy his life more than he has been. Only then does the most amazing thing happen! This is a book for everyone. For parents and teachers it is a nudge to listen to what kids are saying and sharing, to wonder at the ideas that they are willing to explore and to help appreciate and accept the confidence and growth that comes when we honor those ideas. For the children who read it, I can only hope that it inspires them to share what they are thinking with courage, and trust that it will be accepted for what it is. "EVERY SEPTEMBER, the great white sharks return to San Francisco. Their hunting grounds, the Farallon Islands, are just 30 miles from the city. While their 800,000 human neighbors dine on steak, salad, and sandwiches, the white sharks hunt for their favorite meal." 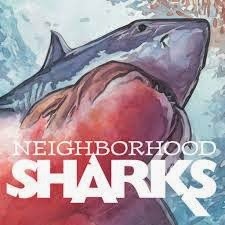 Besides nonfiction books about dinosaurs, is any subject more enticing to children than sharks? Those books are always a huge hit. They are not always as accomplished and informative as this extraordinary book about the 'great whites of California's Farallon Islands'. done in watercolor, pen and ink, and gouache is a feat that has rarely been accomplished with such beauty and power. ... until, all at once, they strike." 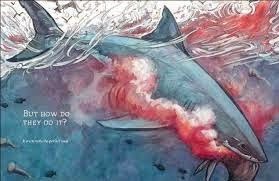 I wonder if you are thinking that this is clear and concise text, and just right for informing young readers about one of their favorite subjects ... the great white shark. You would be right, until you make a page turn, then another. There, you will come face to face with explanatory paragraphs concerning the feeding frenzy that takes place every fall when those sharks follow the seals and sea lions that make the Farallon Islands their breeding grounds. Turn the page again, and Katherine Roy provides text and carefully captioned artwork explaining the perfect body belonging to these terrifying creatures of the sea. The center section looks clearly at the many weapons that a shark has at its disposal to be a 'perfect killer'. The information is so shrewdly shared that you may never want to go in the ocean again. If you weren't frightened of sharks before you knew so much about them, you might quickly change your mind. There is tension here. It is sure to make the reader uneasy at times. There is nothing in her book that will scare her young readers, or bamboozle them. Every bit of text and every single piece of art is designed to inform and educate without ever causing readers to be overwhelmed by what is being shared. I was engaged at every turn of the page, and I know that Ms. Roy's audience is sure to feel the same. Backmatter includes an author's note, an insightful explanation for not discussing the shark's sense of smell, Selected Sources, Further Reading, Online Resources and a map of the Farallon Islands. This is a book worthy of everyone's attention. It is brilliantly designed, impeccably written and superbly illustrated. Impressive? Most assuredly! Beautiful? Indeed it is. You NEED to see this book! 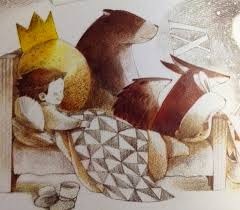 "Once upon a time, in the far deep woods, when the snow looked like a giant hand had tossed a blanket of stars to earth, there lived a rabbit. He was a youngish rabbit, not so small as to be a still-doted-upon baby, yet not big enough to be noticed in any significant way. He loved to sing - not by himself, but he was learning to do so, quite confidently, with others." What a lovely lead to a memorable story! I wonder if the rabbits that gather in my backyard on these cold winter nights are looking for the rabbit-in-the-moon. 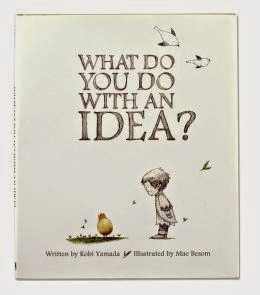 I had never considered this question until I read Martha Brooks' first picture book for children! I know that now I will find myself looking for the rabbit rather than the man when I look at the moon on chilly winter evenings. 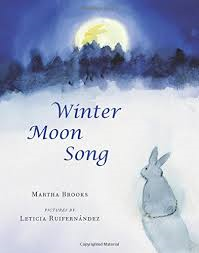 Her book is a story within a story and tells of a young rabbit leaving choir practice, and pausing to wonder about the rabbit he can see on the moon's bright face. As he contemplates its beauty, he remembers a story his mother has told him about their Great Mother, Creator Rabbit. With starvation threatening Creator Rabbit's life on earth, a young rabbit passing by wants to show his respect for Great Mother and his allegiance to her. To save her from a certain death, he jumps into her stew pot in hopes of giving her the sustenance she needs to survive. Great Mother, in a turnabout, grabs him from the pot and hurls him at the moon, where his image can now be seen by all rabbits during the long and dark winter. His image is the motivation for singing Winter Moon Song. We also learn that the song has always been performed within walls. The little one thinks that all rabbits may be missing an opportunity to be in the presence of real magic ... they just need to go outside where they can see the moonlight and feel the pull of the moon's face. It is inspiration for joy and celebration. Thus, traditions are changed by those who are willing to have a say and encourage others to make such a change. Ms. Brooks knows how to tell an engaging and memorable story. The watercolor and ink artwork, done mostly in blues and whites, match the charm of the text and offer a lovely setting for the young rabbit and his new learning. An author's note discusses the origins of the traditional tale found in many different cultures, and mentions that the author learned about it from a Lakota elder. In writing her book, she adds her own spin to what was then shared.